Dig Up Precious Stones and Start an Amazing Rock Collection! National Geographic's Gemstone Dig is an exciting hands-on adventure that kidsabsolutely love! Your child will become a treasure hunter as they carefullyuncover spectacular gemstones using the digging tools provided. NationalGeographic's full-color learning guide makes identifying each specimen easy.The guide is also packed full of information and amazing facts about theircrystals. This science kit includes: One digging brick containing 3 amazing gemstones (quartz, amethyst, and tiger's eye), archeological digging tools, full-color learning guide, and magnifying glass. 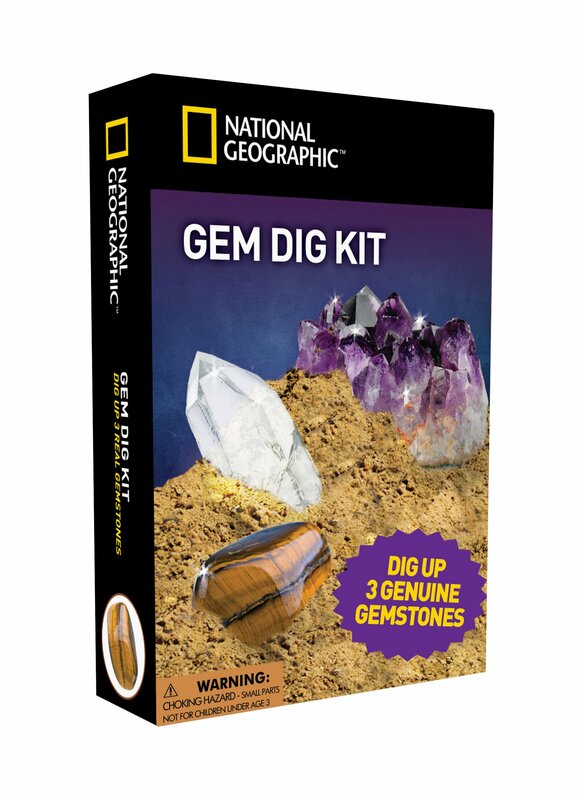 Get your National Geographic Gemstone Dig Kit today and spark a love ofscience in your child that will last a lifetime. National Geographic Toys is proud to provide a 100% satisfaction guaranteewith all our products so that you can buy with confidence. About the National Geographic Society With a mission to inspire people to care about the planet, the 126-year-oldNational Geographic Society is one of the world's largest nonprofit scientificand educational organizations. National Geographic's net proceeds support vital exploration, conservation,research, and education programs.